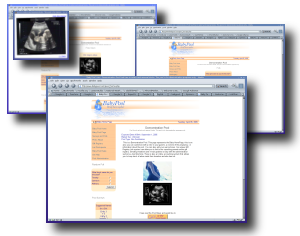 Host your own virtual baby shower at BabyPool.com where guests can play a game, suggest names, answer polls and view gift registry items. Expectant parents can share the joy and excitement of a pregnancy with their family and friends even throught the constraints of time and distance. What is a BabyPool.com baby shower game? A BabyPool.com baby shower game is a baby pool where participants try to guess information about the birth of a baby. For instance if a game is based on time the participants must guess the day and hour of the birth and the winner is the participant who guesses closest to the actual day and hour of the birth. Now if you know the actual time of the birth, for example in the case of a cesarean birth you may choose to have a game based on weight and length. If the baby pool is based on Weight and Length the participants must guess the weight and length of the birth and the winner will be the participant who guesses closest to the actual weight and length. Visit the demonstration baby pool. Start your baby shower game now. 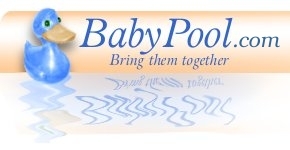 At BabyPool.com each baby pool is its own web site and has a Customizable Baby Pool Home Page, a Baby Pool Page, a Surveys and Polls Page, a Photo Album you can upload and display photos of the baby and family, a Gift Registry listing page, an Baby Pool Administration web site and online help and e-mail support. On the Administration web site the baby pool administrator ( the family member, friend or expecting parent who registered ) can make changes to the Home Page, select options and set rules for the game as well as send out custom e-mail invitations.